Fraud has been an ongoing problem for Communication Service Providers (CSPs) and their customers for decades, with a ever evolving cat and mouse game being played out between CSPs and fraudsters. Unfortunately telecom fraud claims billions of innocent victims across the globe. The cost of fraud to CSPs in 2017 was nearly $30 Billion. What is even more concerning however is that with 5G; the magnitude of the fraud problem will rise hundredfold. The surge in the amount of connected devices and sensors will lead to an exponential rise not just in the volume and velocity of data streaming in, but also significantly increase the level of complexity associated with processing the data to identify and prevent scams. Traditional fraud prevention techniques implemented by CSPs will just not be viable anymore. CSPs have to constantly contend with hundreds of distinct fraudulent schemes; the ever changing schemes, along with their high frequency, globally dispersed origins, and multiple layers of machine and network generated anonymity makes these schemes extremely hard to detect and prevent. Scales to millions of events per second. Ingest and analyze fast streaming data for real-time decision making based on complex Machine Learning rules, while simultaneously querying historical data to continuously improve the model. Import complex models built by data scientists through PMML, PFA, and other standards ensuring quick implementation and consistency. Real-time queries at high throughput with an in-memory, distributed architecture. Core based data and processing distribution. Orchestrate VoltDB with Kubernetes; to easily spin-up new instances and scale-out dynamically, and monitor running clusters. Guaranteed ACID compliance, ensures the consistency and integrity of your data. Complex event processing, to seamlessly normalize data streams in mediation. 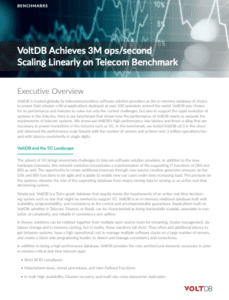 Unparalleled high performance with sub millisecond response times, enabled by a distributed scale out architecture. 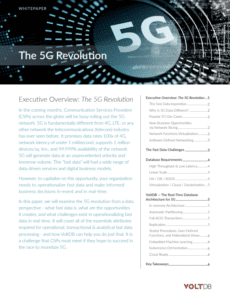 Fast edge analytics supports the stringent QoS metrics dictated by 5G. Several 3rd party TAS applications can run concurrently without any performance degradation. Dynamic service delivery leading to high agility and reduced TCO. VoltDB is cloud native, so real-time applications can run smoothly in the cloud. 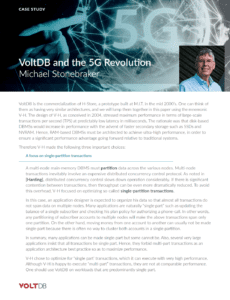 Resiliency, high availability, active active disaster recovery are fundamental features of VoltDB, that are not compromised for applications running in the cloud. Proven security technology such as TLS & Kerberos built-in, along with auditing and monitoring tools to verify usage, and identify attacks on system. Fraudsters hack into the CSPs network and make expensive calls to international phone numbers resulting in high bills for subscribers. Once the calls are made and billed, either the subscriber or the CSP have to bear the costs. Learn more from our recent blog post, “Preventing Telecom Fraud in the 5G Era”. IP Exchange (IPX) – IPX is used by CSPs to exchange IP based traffic between subscribers of different cellular and fixed operators along with other ISPs via an IP based network-to-network interface. Fraudsters often exploit the vulnerabilities between the network interface to hack into a subscriber’s device and rack up large bills. Learn more from our recent blog post, “Preventing Telecom Fraud in the 5G Era”. Gartner is predicting over 20 Billion connected things by 2020. What gets overseen in the IoT hype, is the sheer amount of “connected things” that will be left unsecured. The massive scale of IoT and the access to valuable data offers up a very compelling opportunity for fraudsters. IoT devices have already been used to make fraudulent purchases, and even to launch DDoS attacks. Learn more about IoT applications and VoltDB. Having to combat a variety of fraud, such as international-bypass fraud in real-time. Taking actionable decisions, such as: blocking fraudulent transactions before they are approved. Combine core networks, real-time network testing and big data analytics to detect telecom fraud in real-time and kill it. Real-time decisioning leveraging VoltDB’s ML capabilities. Management of 50M calls per day per CSP. Perform 30,000 ACID compliant TPS per customer. Telco grade platform with HA, XDCR.